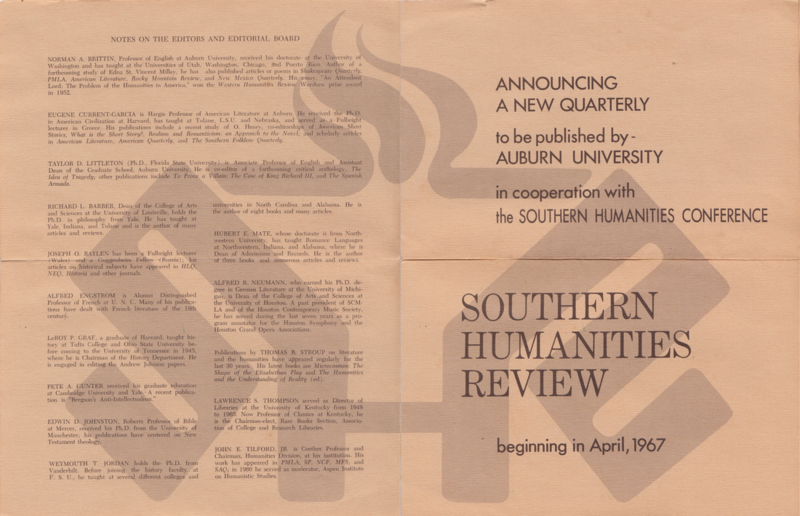 The poster you see below was our first great find when we began exploring our archives in the fall of 2014: a promotional poster trumpeting the arrival of a new journal of the humanities in April 1967, meant to be thumbtacked, we can assume, onto campus bulletin boards across the late-1960s South. So far, we’ve found only one copy of this poster, which we plan to frame and display in the SHR office. But this two-sided affair (French-folded for easy distribution) presents us with a dilemma: Which side should be featured in the frame? 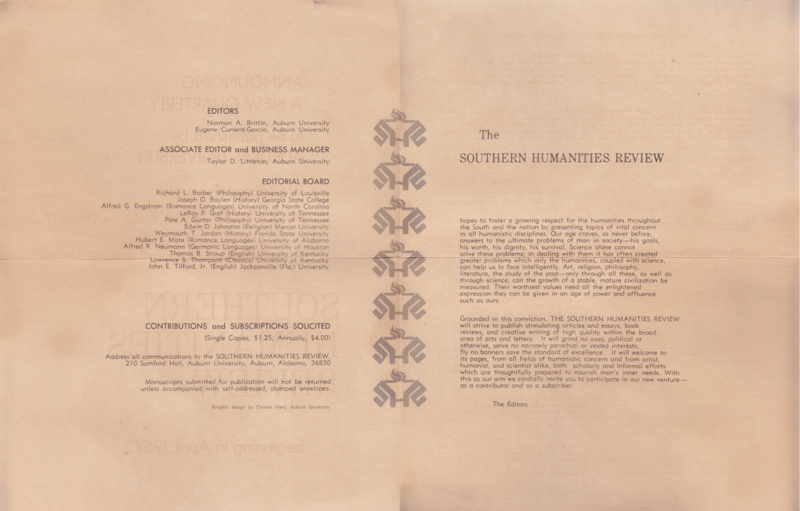 The poster’s front side speaks loudly: “ANNOUNCING A NEW QUARTERLY to be published by AUBURN UNIVERSITY in cooperation with the SOUTHERN HUMANITIES CONFERENCE.” Printed to the left are the bios of our founding editors and editorial board. And behind all of this, stretching across the entire layout, you’ll find our old-school (and cleverly designed) “SHR torch” logo. On the poster’s back side, a more understated approach. A column of torch logos climbs up the centerfold. To the left, a roll call (again) of our founding editors, as well as subscription and pricing information. Only $1.25 for a single issue! (And we remain one of the most affordable literary quarterlies around). [SHR] will grind no axes, political or otherwise, serve no narrowly parochial or vested interests, fly no banners save the standard of excellence. It will welcome to its pages, from all fields of humanistic concern and from artist, humanist, and scientist alike, both scholarly and informal efforts which are thoughtfully prepared to nourish man’s inner needs. True, SHR’s interests have shifted a bit over fifty years. We no longer publish scholarly essays geared toward a general humanities audience. Our book reviews have moved from the back pages of our print issues to a more accessible online venue. And these days, we do more “wild fiddling and dancing” than talking about fiddling and dancing, as former editor R. T. Smith put it recently. But in essence, SHR’s current masthead still strives to hit the marks set by our founders. We “fly no banner save the standard of excellence.” Simply put, we publish the best essays, short stories, and poems we can get our hands on. And then we deliver them to your doorstep, in one slim volume, four times a year. The poster’s front design is perhaps more eye-catching, but I expect we’ll favor the poster’s back side, once we finally get around to framing the thing. That mission statement—it should be hung where we can see it every day. As rallying cries go, it’s a mighty fine one.